It’s amazing what digging into older computer files reveals. I recently located the Poster I developed for the Sloan-C International Conference on Online Learning 2010. I’ve decided to share this nugget of information with you. A PDF version (better quality image) can be found at WebCampus Poster. The topic of the Presentation was the Quality Audit (QA) Process used by Stevens Institute of Technology’s WebCampus Department to evaluate the use of technology and interaction in its online courses. By conducting the QA process on individual courses, WebCampus hopes to A) provide feedback to assist the instructor in adjusting their teaching pedagogy to create a more effective online learning environment and B) collect data regarding Best Practices in Online Learning. 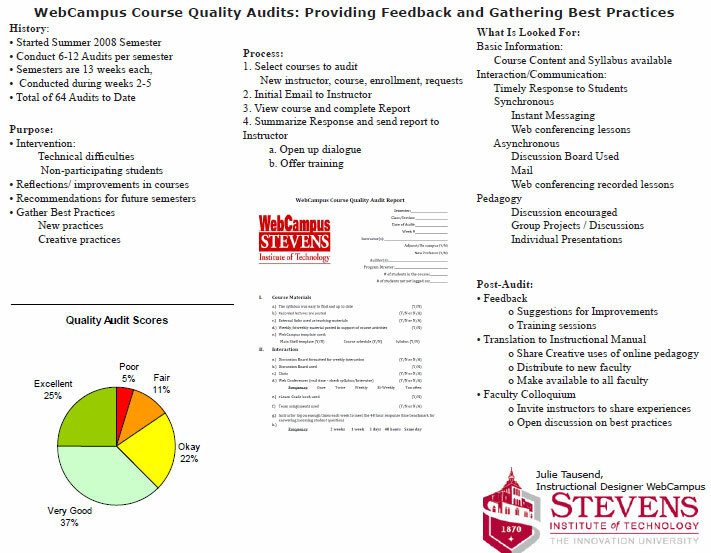 The Quality Audit Process is something close to my heart, mainly because it was one of my first major tasks at Stevens Institute of Technology. I was asked to conduct a Quality Audit of an existing and currently running online course. I followed the process using the already established Quality Audit Form (seen center of the Poster). When I provided the feedback to the Instructor, I was blown away by his response email. To say the least, it was very negative. As a new employee, I handled the situation the best I could. I assessed the situation and addressed the instructor’s concerns as diplomatically as possible. But more importantly, I realized the Instructor was also “blown away” by the Quality Audit. He was not informed that the Audit would take place or given a reason for why it was conducted. Once I realized this, I adjusted the Quality Audit Process to include a “Pre-Audit” phase. This includes emailing the selected Instructors and informing them of the benefits of the Quality Audit while assuring them that the information gathered would be in no way used during their employee review. Since changing the process (and since this poster was created), roughly 200 course sections have been Audited, and I have not received any negative responses to the QA taking place. Consider the lesson learned- Open Communication is necessary for acceptance of constructive feedback.